MatchKings® are the pride of the Sierra bullet family, unmatched worldwide and truly world class in all respects. Competitive shooters have relied on the consistent accuracy of Sierra'sMatchKings® for decades, resulting in a history of state, national and world records that is the envy of our competitors. 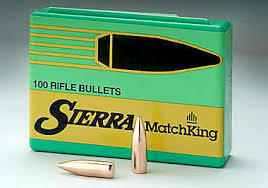 Sierra MatchKing® bullets have set the standards worldwide for consistent accuracy in handguns as well as rifles. Since the introduction of the high performance Remington XP-100 and similar handguns chambering larger rifle cartridges, all 30 caliber MatchKings® have been used in handgun silhouettes and long-range target competitions. Sierra's famous MatchKing® design assures superb accuracy, flat trajectory, and high momentum delivery with low sensitivity to crosswinds at all ranges. While they are recognized around the world for record-setting accuracy, MatchKing® and Tipped MatchKing® bullets are not recommended for most hunting applications. Although MatchKing® and Tipped MatchKing® bullets are commonly used for varmint hunting, their heavier jackets will not provide the same reliable explosive expansion at equivalent velocities in varmints compared to their lightly jacketed Hornet, Blitz or Varmintercounterparts.